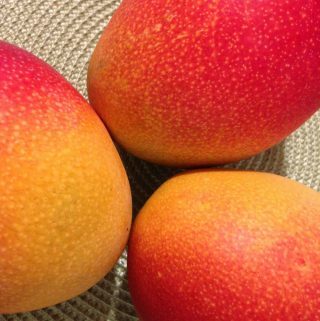 The topic of mango ripeness is an *important* one because unlike some other fruits, mango varieties come in a wide range of colors. Some varieties are green, some are reddish, some are pinky or orange-ish. Some are pure yellow. Along with the wide range of colors comes confusion – if you can’t use color as a judge of ripeness, then what can you use? Here are the two foolproof metrics that should BOTH be present. 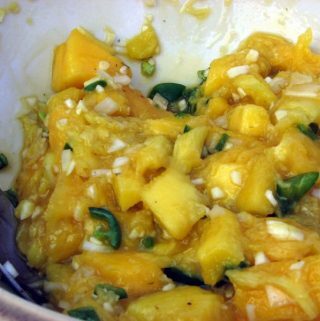 1) The mango should be soft to the touch; it should have some give. Since it’s kind of hard to know what the wrinkles might look like if you haven’t seen them before, here’s a couple of photos to help you out. The Haden on the top photo is a little more obvious than the Ataulfos below. That said, see the subtle wrinkles on the Ataulfo mango that is sitting on the top of the others? (the one closest to the top edge of the photo) And the one in the lower left foreground? You can see the wrinkles forming. I cut these open shortly after the picture was taken and they were in an absolutely perfect state of ripeness. If you have mangoes that have reached this stage but need a day or two to eat them, stick them in the fridge and that will hold them over for a bit, but not forever!